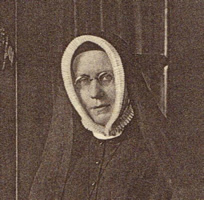 Janet Erskine Stuart was the Superior General of the Society of the Sacred Heart from 1911 to 1914. She was the first Superior General to travel extensively, visiting the Society in many parts of the world. She is remembered as an outstanding educator and spiritual guide. Janet Erskine Stuart was born in 1857 at the Cottesmore Anglican Rectory in Rutland, England. Her father was an Anglican minister, and her conversion to Catholicism at the age of 21 was difficult for him. In 1881 she entered the Society and spent almost her whole life as an RSCJ as a member of the Roehampton community. Janet is credited with raising the standard of teaching at Sacred Heart schools and her influence in educational circles extended beyond the Society, and indeed beyond the Catholic Church. She expanded teacher training for Catholic women in England and was progressive in ensuring that Religious of the Sacred Heart who needed them were able to gain university degrees. Janet Erskine Stuart’s influential book, The Education of Catholic Girls, was the first book by a member of the Society to be published for a general audience rather than being printed on a private press for circulation among the convents. Janet insisted on a personalised education that also met high academic standards. Janet’s religious superior at Roehampton was Mabel Digby, who quickly entrusted Janet with responsibility for the formation of the novices. When Mabel Digby became Superior General in 1894, Janet succeeded her as the Superior of the community at Roehampton. Between 1898 and 1901 Janet Erskine Stuart undertook extensive travels around the USA and Latin America on behalf of Mabel Digby. After she succeeded Mabel as Superior General in 1911, Janet visited communities of the Society in many parts of the world – including Australia. 1857, Janet Erskine Stuart was born at Cottesmore Rectory in Rutland, England. 1878, Janet converted to Catholicism. 1882, Janet entered the Society. 1894, Janet became the Superior of the Roehampton community. 1898 – 1901, Janet travelled extensively in the USA and Latin America. 1911, Janet was elected Superior General of the Society. 21 October 1914, Janet died at the age of only 57. The website of the England and Wales Province hosts a trove of resources on Janet Erskine Stuart. More resources on Janet Erskine Stuart on this website can be found here.